Burst 003, North Haven, Australia. A collaboration between architects Jeremy Edmiston and Douglas Gauthier. Rear view. © 2008 Floto + Warner. NEW YORK.-As part of the exhibition Home Delivery: Fabricating the Modern Dwelling, which will be on view at MoMA from July 20 to October 20, 2008, The Museum of Modern Art has selected five architects to display full-scale, prefabricated houses in the outdoor space to the west of the Museum building. The houses are designed by the firm Kieran Timberlake Architects (Philadelphia, Pennsylvania) and architects Lawrence Sass (Cambridge, Massachusetts), Jeremy Edmiston and Douglas Gauthier (New York, New York), Oskar Leo Kaufmann and Albert Rüf of Oskar Leo Kaufmann Architects (Dornbirn, Austria) and Richard Horden (London, England, and Munich, Germany). Home Delivery: Fabricating the Modern Dwelling is organized by Barry Bergdoll, The Philip Johnson Chief Curator, Department of Architecture and Design, with Peter Christensen, Curatorial Assistant, Department of Architecture and Design, The Museum of Modern Art. The exhibition will include a total of 63 projects: the five houses on view in the outdoor space next to the Museum, and 58 projects on view in the sixth-floor International Council of The Museum of Modern Art Gallery, offering the most thorough examination to date of both the historic and contemporary significance of factory-produced architecture from 1833 to today. The five projects to be displayed in the outdoor space next to MoMA were chosen after an initial consideration of some 400 architects and firms, from which 21 proposals were solicited. The proposals were evaluated by a jury of internal Museum curators and staff, as well as members of the architectural community, who advised the curatorial team in making the selections. The five houses represent designs by emerging and established architects, different styles of homes that use varied manufacturing techniques, and houses that span the economic market. Cooper Robertson Partners will act as Consulting Architects in assembling the houses for the exhibition. These five contemporary projects continue MoMA's rich history of exhibiting full-scale houses, which includes The House in the Museum Garden (1948), a house by Marcel Breuer that was erected in the Museum's Abby Aldrich Rockefeller Sculpture Garden; Exhibition House by Gregory Ain (1950); and Japanese Exhibition House (1955). The architects participating in Home Delivery will have the rare opportunity to present commercially viable domestic creations, prototypes, and entirely new designs produced specifically for the exhibition. The selected designs showcase a variety of approaches to prefabrication. These include a green urban dwelling made of recyclable materials by Kieran Timberlake Architects, a section of a multistory house with floors that fit into shipping containers and can stack together like blocks by Oskar Leo Kaufmann and Albert Rüf, a house for New Orleans to help those displaced by Hurricane Katrina by Lawrence Sass, a computer-generated house built from a computer program that automates a blueprint by Jeremy Edmiston and Douglas Gauthier, and a tiny cube intended for use as athletic or student housing by Richard Horden. An exhibition Web site launching in mid-March will include weekly diary postings from each of the five architects and from the curators of the exhibition, recording the process of fabricating, delivering, and assembling the houses leading up to the July 20 opening. The site will underline the importance of prefabrication as a matter of process and product. 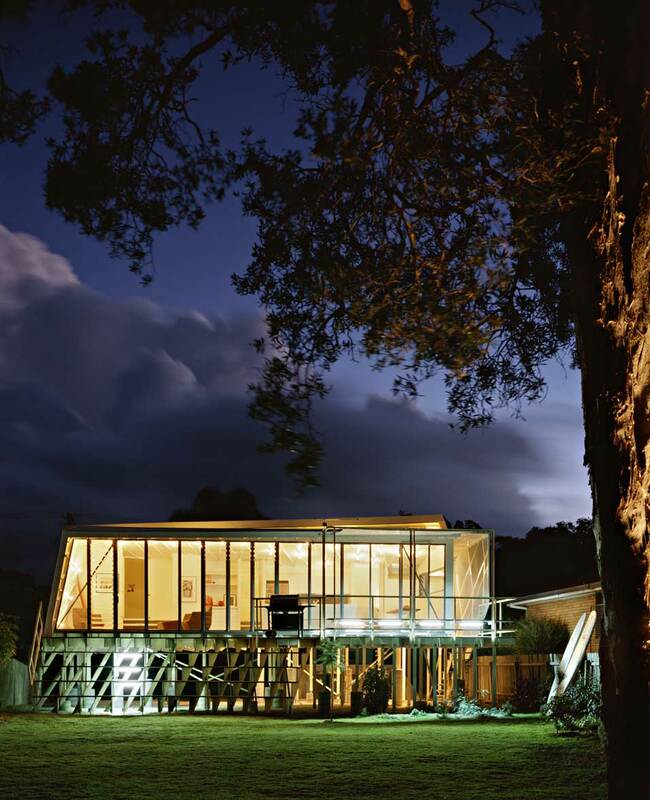 Kieran Timberlake Architects: Cellophane House - The Cellophane House was designed in 2007 specifically for Home Delivery, with steel frames that snap together, glass windows that slide into place, and systems of sustainable architecture. The Cellophane House is intended as a prefabricated solution for an urban dwelling. Requiring no welding or sealing, it is made of recyclable materials and equipped with photovoltaic cells that allow it to be off-grid and recyclable. Kieran Timberlake Architects, based in Philadelphia, Pennsylvania, is led by partners Stephen Kieran and James Timberlake. Oskar Leo Kaufmann and Albert Rüf: System 3 - The System 3 house is an austere and elegant structure designed in 2007 specifically for MoMA's Home Delivery exhibition. While the house can have multiple storieseach of which can serve as a complete living unitjust one story of the house will be displayed at MoMA. Each story of the house fits perfectly inside a shipping container for easy transporting, and the stories are stacked together like blocks for assembly. Offering a more refined alternative to many American prefabricated houses, the System 3 uses both modular and flat-pack elements. Austrian architect Oskar Leo Kaufmann established an office for architecture with Albert Rüf in 2001 in Dornbirn, Austria, designing office and industrial buildings, single-family houses, and hotels in Austria, Germany, Japan, and the U.S. For the past 10 years, the architects have been actively developing building systems and prefabricated prototypes. Lawrence Sass: House for New Orleans - A project intended to help with rehousing those displaced by Hurricane Katrina, the House for New Orleans was designed as a prototype in 2006. It consists of laser-cut plywood panels with grooves and joints that allow each piece to fit neatly into the next without nails or hinges. The house's filigree is designed to reflect the local architecture of New Orleans, but could be adapted for other locations. Architect Lawrence Sass is a designer, researcher, and teacher at the Massachusetts Institute of Technology (MIT) in Cambridge, whose work explores the relationship between design, computing, and digital fabrication. His current research projects explore a range of interests in digital fabrication, specifically by the study of digitally fabricated wood and concrete homes. His research is centered on the advent of design systems structured around digital fabrication. Jeremy Edmiston and Douglas Gauthier: Burst *003 - Designed to be assembled on site from laser-cut pieces, the Burst *003 house is a computer-designed remake of the typical prefabricated box. Working from a computer formula that automates the specific pieces needed to create the house desired, the project is based on a system that can be adapted to a changing set of criteria. The 2003 prototype of the Burst *003 project was built on Australia's Northeast coast, and won the Royal Australian Institute of Architects 2006 Wilkinson award. Jeremy Edmiston, originally from Australia, has been practicing, teaching and researching architecture in New York City for 16 years. His practice is based in re-evaluating the relationship between the built and natural environments in all its permutations. Douglas Gauthier is a New York-based architect whose work focuses on the structural, programmatic, and environmental parameters that influence architecture. Richard Horden: Micro Compact Home - An aluminum-clad, perfect cubic form, measuring approximately 76 square feet, the Micro Compact Home is a tiny dwelling intended for use as athletic or student housing, or as a miniature vacation house. It is commercially available and recently went on the market in Europe. Deliverable by helicopter or crane, the tiny house is entirely portable. Its interior is fully equipped with modern amenities, and its exterior features both a roof topped with photovoltaic panels and walls containing wind turbines, allowing the house to function off-grid. Architect Richard Horden is a founding partner of the London-based firm Horden Cherry Lee Architects. Since the 1970s, both the firm and the architect's work have been committed to achieving more with less, optimizing visual and technical lightness with a minimal use of materials. Horden initiated research on the Micro Compact Home (mch) with a team of students and collaborators as a professor at the Technical University in Munich.